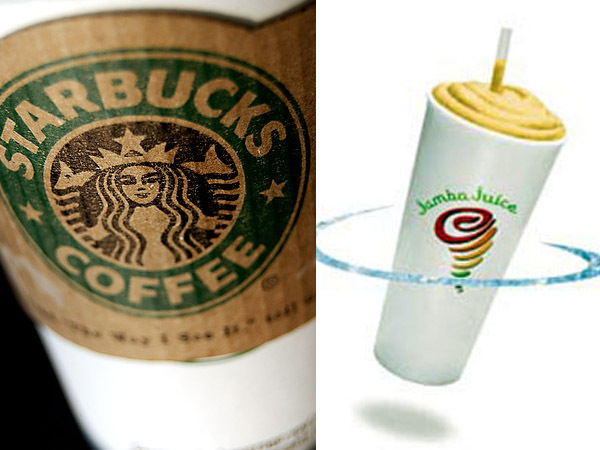 If I were to compare the two companies to cities, they would be east and west polar opposites, Starbucks being New York and Jamba Juice the most laid form of San Diego. Despite Seattle being the birthplace for Starbucks, my comparisons actually have nothing to do with ingredients, flavors or style. Instead, what contrasts between these two places so much is the ordering process and environment. As of late Jamba Juice has added coffee and breakfast to their healthy list of options, in order to attract the morning crowd and offer variation. I was at the airport this last Wednesday morning at 6am, and after battling security to make it to my gate in time, I saw the Jamba Juice and decided "ok let's get some nutrition before a long flight." *(now keep in mind that everything at the airport is supposed to be more efficient and processed quickly because people are on the go) BIG MISTAKE! You know that anxiety you get when you're late for work, or missing an appointment and are stuck in traffic, constantly looking at your watch and getting those cold sweats? I felt that in the line at Jamba Juice. With two people in front of me ordering, I was able to plot out this entire blog and the comparison I wanted to make. The problem is not just the people that work at Jamba Juice, but it's also the people that order from there. They're the type of people that swear they are certain they know what they want, till they get to the register then just stare. After 3 minutes of choosing, the cashier HAS TO ask them if they'd like to ad "insert value for the day", and then the customer ponders for another 3 minutes and goes "ok". Have you ever noticed that it takes forever to get your custom and fresh smoothie at Jamba Juice? As a trained and seasoned coffee drinker, I realized that Starbucks goers know what they want, order efficiently and rarely cause a delay in the assembly line when ordering. In addition to that, Starbucks baristas have your drink practically done by the time you're done ordering and paying. Perhaps it's the caffeine that doses us up with energy to operate like a well oiled machine, but I'll say this, never once in line at a Starbucks have I ever had that time to ponder a lengthy blog post. While I love both places, I think there's a time and place for each. Don't head to Jamba Juice if you're looking to be on the gogogo, save it for a day when you're enjoying a warm relaxing walk, and have time to appreciate the site, sounds and colors of life. Starbucks is where you go to fuel up, get going and make life happen. haha. Perhaps it's not so bad to slow down, but for now, I haven't got the time to.